'B' Extension TL 30 allows you to enlarge the mezzanine on the same direction as secondary beams; indeed, you needn’t dismantle the whole mezzanine. You can get up to 60m² grace to this enlargement. This KIT contains 2 double height-adjustable columns, a lightweight frame with adjustable length and width. (extensible to 30m²) with the same characteristicas as Tl 30 structure and structural wooden board to cover the surface. Do they support the same weight as the main structure? Yes. They have the exact same specifications as the initial structure. To install Tecrostar mezzanines you need 2 adults (they do not need to be DIY experts). It is recommendable to use personal safety equipment like gloves, boots, etc. in order to avoid accident. 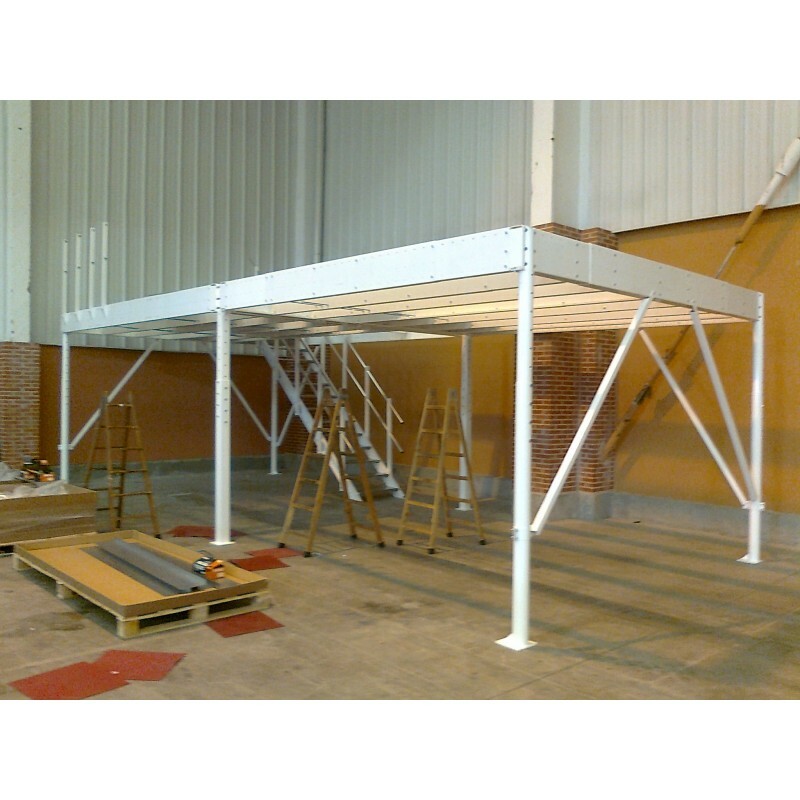 When installing range L mezzanines you may need to use some type of scaffolding or ladder for working at heights and manual or electric lifting machinery to raise the primary beams, particularly if the structure is more than 3m high. The other ranges can be lifted easily by hand. You can find all the tools required to assemble it and tested by Tecrostar in the tools section. Pre-assemble the structure on the floor in the desired area. Raise the outer structure to the desired height. Finish assembling the structure and floor. How long does it take to install? You can do it yourself with the help of a friend. It is easily installed in a few hours, depending on the product. The times are a guideline and for assembly only. You need to add the time it takes to measure up, move the components to the location, clean up, etc. What if the access to the delivery address is complicated? Sometimes, the carrier cannot access to point of delivery due to an extremely narrow street or any other difficulty. In such cases, the carrier cannot do the delivery with the usual truck and he may need to use a different vehicle or extra support. If the carrier considers that the point of delivery is complicated, request a quotation. If you don’t inform in advance that the access is complicated, the delivery will be paralysed until you pay the extra cost.